Do you want to see DJ Demers in Singapore? We have teamed up with those lovely folk at The Merry Lion, Singapore’s only full time comedy club for some summer fun. 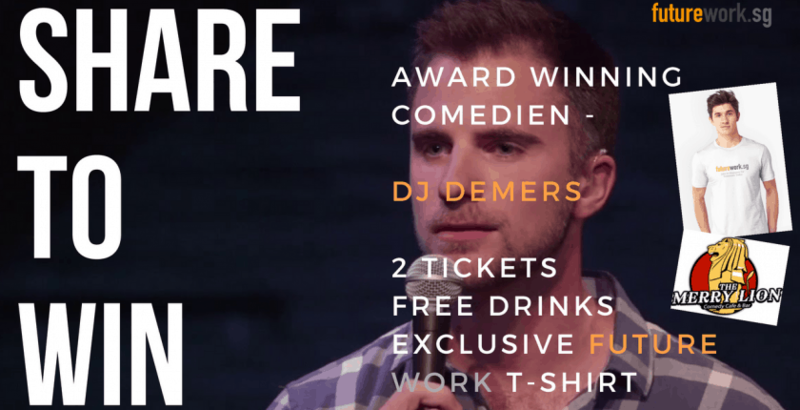 We are holding a competition where the lucky winner will receive 2 tickets to see the international, award winning comedian DJ Demers in Singapore. We are even going to throw in a couple of free drinks and an exclusive Future Work T-shirt… Nice! Add your name and email in the fields below and hit the ‘Submit’ button. Share with your friends for even more chances to win! Alternatively, click here to enter the competition for a chance to win a pair of tickets to see the Internationally acclaimed comedian DJ Demers in Singapore’s only full time comedy club – The Merry Lion, 2 free drinks and an exclusive Future Work T-shirt. Share your unique link with your friends to get even more chances to win. Links can be shared on Facebook, Twitter, Pinterest, Google+, Linkedin, Whatsapp, Messenger and eMail. The winner with the most points win. In the event of a tie, a winner will be chosen at random. The competition closes on 31-07-2018 at 6pm and the winner will be notified within 48 hours. Please share responsibly and do not spam! Good Luck! D.J. Demers (Canada) is an award-winning stand-up comedian. D.J. appeared on season 11 of America’s Got Talent. He has performed stand-up on Conan twice and was the winner of the 2014 Homegrown Comics Competition at the prestigious Just For Laughs festival in Montreal. After winning the competition, D.J. was invited to perform at a TV taping, the first time that has happened in festival history. His debut stand-up album, “Indistinct Chatter”, was released in 2017 to great acclaim. In June of 2017, D.J. was the featured Comedian of the Month on Laugh USA on SiriusXM. In 2018, “Indistinct Chatter” was nominated at the Juno Awards for Comedy Album of the Year. For the hard of hearing, the Friday night show at The Merry Lion will be signed. Update – 1st August 2018: We are happy to announce good fortune has smiled on Huiru Cai who is the auspicious winner of our prize draw giveaway. She will be soon be enjoying a night of award winning comedy with DJ Demers at The Merry Lion, Singapore’s only full time comedy venue.